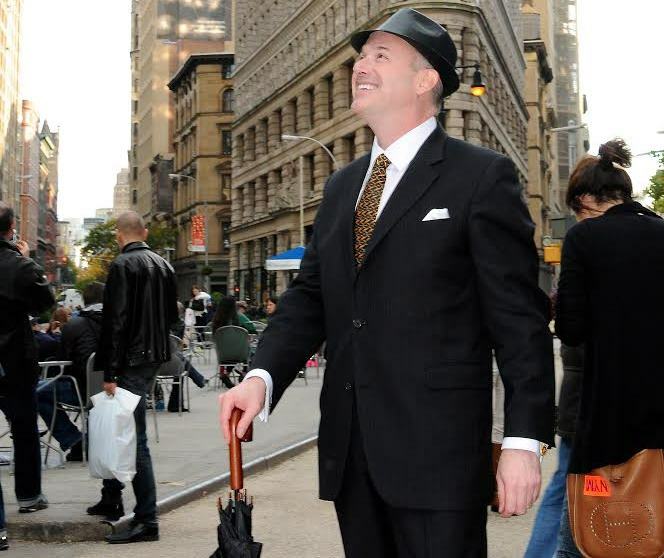 Ken Slavin’s new show, “Cocktails With Ken: A Saloon Jazz Mixology” is slated for Thursday, January 7, at 9:30 p.m. for his fourth headline appearance at the popular Metropolitan Room, 34 W. 22nd Street. Slavin will be accompanied by a classic New York City jazz trio: star pianist John Colianni, who was Mel Torme’s pianist for six years and has worked with such legends as Cleo Laine and Bucky Pizzarelli; guitarist Paul Bollenback, an internationally acclaimed solo artist who also tours with Joey DeFrancesco and has worked with such stars as Della Reese; and veteran bassist Frank Tate, who worked with Bobby Short for the last ten years of his legendary run at New York’s Cafe Carlyle. Music director for the show is Barry Brake, a noted pianist/composer/arranger/producer who works with Ken regularly in Texas and throughout the U.S.
Slavin’s January 7 performance will feature an elegant and eclectic program of great saloon and torch songs- all served up with swingin’ jazz touches. Though based in San Antonio, Slavin has made significant in-roads in New York after his Big Apple debut at the Metropolitan Room on Halloween Night 2013. His latest CD, recorded on that special night and produced by Tony Award-winner Paul Boskind (co-producer of the revival of The Normal Heart in 2011), is heard on jazz radio stations coast to coast and has received excellent media reviews. He also recently became a voting member of The Recording Academy, which produces the annual GRAMMY Awards. A native of the Tri-State area—he was born in New London, Connecticut, and spent his childhood years on Staten Island, in Newark and in Greenwich, Connecticut—Slavin is based in San Antonio and has been performing in Texas and around the country for 25 years. A self-described “late bloomer,” he began his music career just before he turned 29. Now 54, Slavin has racked up numerous awards and glowing reviews across the country and overseas. His CDs sell regularly in Japan, Europe and Latin America. He also recently became a voting member of The Recording Academy, which produces the GRAMMY Awards. His CDs are programmed on many traditional and internet radio stations in the USA and Europe. His critically acclaimed I’ll Take Romance has been spotlighted on U.S. radio programs from Alaska to New York and as far away as the United Kingdom, Italy, Poland, New Zealand, Portugal, France, the Czech Republic and Mexico- and is currently programmed on the “Singers and Swing” channel of cable TV’s Music Choice network, headquartered in New York City. It is also a Spotify, Amazon.com and Apple iTunes favorite. Slavin has opened for such jazz legends as The Four Freshmen, Eddie Palmieri, Dee Dee Bridgewater, David Sanborn and Chico Hamilton. He also has performed in concert with the internationally acclaimed Jim Cullum Jazz Band, legendary New York- based jazz pianist Johnny O’Neal, son of renowned jazz vibraphonist Terry Gibbs. He also has given private performances for Grammy Award winners Helen Reddy and Vikki Carr and recently opened for smooth jazz saxophone sensation Jeff Kashiwa of Seattle at the annual San Antonio Summer Art & Jazz Festival. Named by Zagat as the number-one jazz cabaret room in New York City, the Metropolitan Room is one of the most popular music venues in Manhattan and is known as the “home” for big name talents and rising stars. The Metropolitan Room is located in the Flatiron/Chelsea District at 34 W. 22nd Street. A high-end cabaret and jazz club, The Metropolitan Room brings the best in live music to New York City every night of the week at 7p.m., 9:30 p.m. and 11:30 p.m. Fabulous award-winning Broadway, TV, film and radio performers take the stage in an intimate 115-seat atmosphere reminiscent of the golden age of cabaret. For more information, call 212-206-0440 or visit metropolitanroom.com. Tickets are $25, $85 and $115 and are available online at MetropolitanRoom.com or by calling 212- 206-0440.